You are here: Home > There’s gold in them thar hills; and there’s much more where it came from. In 1849, gold gave a kick start to the new State of California. Its non-native population grew 100-fold in a single year. Its miners soon took 300 tons of gold ($12 billion at today’s prices) from the ground. How did the gold get there? A few months ago, an extraordinary event—maybe the most widely studied event ever—showed us gold is made in collisions between certain strange stars. The origins of atoms of the 92 natural elements was long a puzzle. We now know the four lightest kinds of atoms (hydrogen, helium and traces of lithium and beryllium)—but no others—were made in the first few minutes of the Big Bang. A billion years later gravity had collected clumps of hydrogen to form stars. Ordinary stars are nuclear reactors whose cores heat them by making heavier atoms up to nickel, number 60 in the Periodic Table of elements. When big stars become unstable and explode they fling these atoms into gas clouds where gravity can collect them to form new stars—or planets such as ours. This process would give rise to Earthly nickel mines but not a nickel’s worth of gold would miners dig. Nor, for that matter, could they find its companions—platinum and iridium—or other heavy elements. As physicists came to grips with the whole range of nuclear reactions in the 1970s they could see just one way to create that gold rush. Only an intense supply of neutrons can build up lighter atoms one unit at a time into heavy ones like gold (number 79) before unstable stepping-stone atoms decay. And only one such source of neutrons was known—or at least imagined. Today we know it as a neutron star. The neutron star was first envisaged in 1934 as the dense and tiny remnant of a large star after it collapsed under its own gravity. 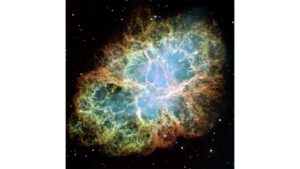 Called a supernova, it can create a black hole into which much of the star’s mass disappears. If the collapse does not go that far it forms a tiny star made mainly of densely packed neutrons. With mass greater than our Sun’s (about five thousand-trillion-trillion tons), temperature up to a trillion degrees and diameter of only twenty kilometers, a neutron star can spin at higher revs than any car engine. 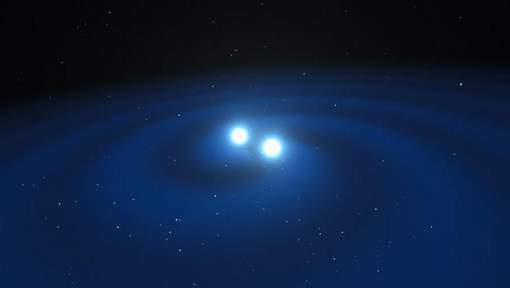 Sometimes two neutron stars orbit about each other. Their gravity, a hundred-billion-fold greater than Earth’s, gives off gravitational waves thus losing orbital energy, as was first observed in 1982. As they lose orbital energy the two eventually collide. General relativity theory describes their frenzy in the last few minutes as they speed up to maybe 1000 orbits per second. Then, when they touch, all hell breaks loose as the two dense spinning stars smash and merge into each other. These violent events may be quite common. Our galaxy—the Milky Way—likely holds about a hundred million neutron stars. The visible universe has about a hundred billion galaxies. Until a few months ago the big issue was how to snap a neutron-star smash before the action was over. This issue has now changed fundamentally. We have the twin gravitational telescopes of LIGO in the United States and a third, Virgo, in Italy. They detect gravitational waves. On August 17 last year, all three picked up the predicted signal from the last moments of a pair of neutron stars. They pointed to a galaxy called NGC 4993 more than a hundred million light years away. Tipped off, the astronomical community swung into action. Seventy observatories slewed telescopes for radio waves, for visible and invisible light, for X-rays and for gamma radiation to search for signs of the expected aftermath of the collision. The worldwide effort yielded an unprecedented treasure trove of information. From the first seconds after the hundred-million-year-old gravitational waves swept by Earth, through the next hours, days and weeks, thousands of astronomers recorded every kind of signal they expected from a neutron-star collision. One signal was the signature glow from a vast pool of new radioactive heavy elements. Trillions of times a million tons of new red gold was sent on its way to new stars and new hills and—who knows, maybe somewhere, sometime—new miners. Closer to home there’s new gold of another kind. It’s hard to overstate the immense advance in astronomy that comes from the ability to forecast—even by a few minutes—the arrival here of events that happened millions or billions of light years ago. Stay tuned for news of a cosmic gold rush.